Japan will seek a partial resumption of commercial whaling at a meeting of the International Whaling Commission later this year, officials said Wednesday. Tokyo has regularly sought the easing of the IWC's moratorium on commercial whaling and continues to kill whales as part of what it calls a "scientific research" programme despite international criticism. 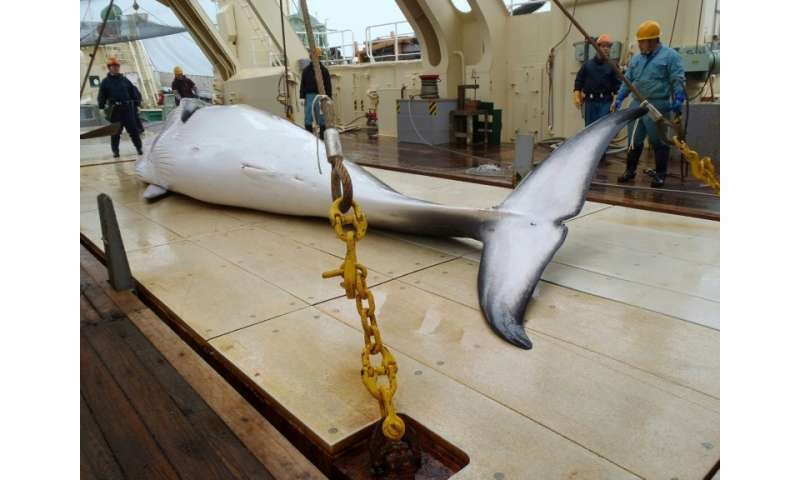 At September's meeting in Brazil, Japan "will propose setting a catch quota for species whose stocks are recognised as healthy by the IWC scientific committee", Hideki Moronuki, an official in charge of whaling at Japan's fisheries agency, told AFP. Moronuki said the proposal would not specify which whale species and how many mammals Japan wants to hunt, but he said the IWC classifies several species as no longer depleted. The moratorium has been in place since 1986, and Japan's previous attempts to win a partial lifting have been unsuccessful. Japan will also propose measures to change the body's decision-making process, lowering the threshold for proposals to pass from three quarters of members to half. "The IWC has not been functioning. We should get united to build a more cooperative system," Moronuki said. Tokyo has continued to hunt whales despite the moratorium, exploiting a loophole allowing "scientific research". It says the research is necessary to prove whale populations are large enough to sustain a return to commercial hunting. It makes no secret of the fact that meat from the expeditions ends up on dinner tables, despite a significant decline in the popularity of whale meat. Whales were a key protein source in the immediate post-World War II years, when the country was desperately poor, but most Japanese now say they rarely or never eat whale. But foreign pressure on Japan to stop whaling has hardened the positions of conservative activists and politicians. Japan cancelled its 2014-2015 hunt after the International Court of Justice said permits being issued by Tokyo were "not for purposes of scientific research". But it resumed the hunts in 2016, and conservationists were furious this year after Japan reported it had caught 333 minkes on its latest expedition, 122 of which were pregnant. Japanese officials said the high rate of pregnant whales showed the strength of the minke population. Japan's last bid to ease the restrictions was in 2014, when the IWC voted down its request to hunt 17 minke whales in its coastal waters—where smaller whales which Japan claims are not regulated by the committee are already hunted.